In this 4 hour class you will learn a variety of piping techniques including how to pipe with both butter cream and royal icing. You will be taught how to create the beautiful two tone butter cream Rose swirl effect and how to pipe intricate royal iced designs. You will decorate and take away 12 vintage chic cupcakes, perfect for a wedding or an afternoon tea party! You will be taught how to hand make a selection of vintage decorations. The Wedding Cupcakes Vintage Chic class focuses on the shabby chic theme that is currently ‘on trend’ and a popular design for wedding cakes and cupcakes. Using a soft pink, pearl and baby blue colour scheme, you will learn how to hand make pretty decorations and pipe with both butter cream and royal icing. 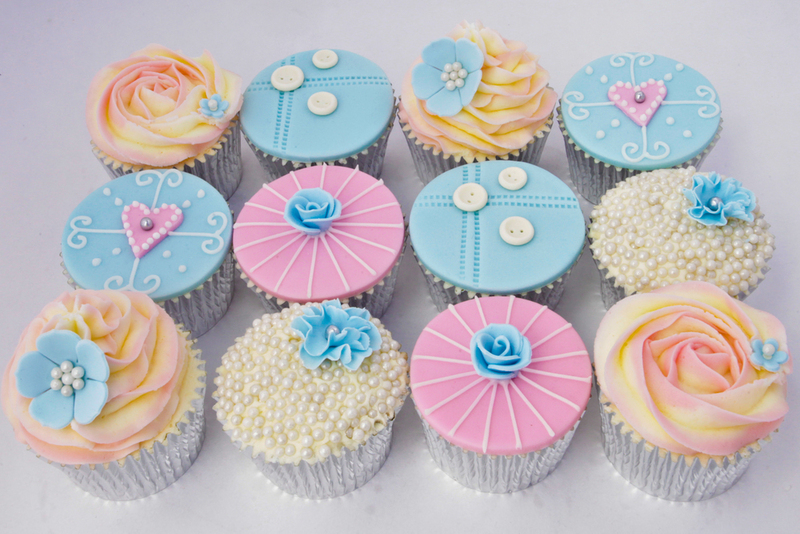 This cupcake class is the perfect follow on from the Classy Cupcakes or Bows, Rose and Pearls Cupcake Class and is ideal for those wishing to advance their skills, however no previous experience is necessary. All ingredients and equipment to create the class designs is supplied for use for the duration of the class, including an apron to protect your clothes. Once you have booked your class space, all you need to do is turn up! You will learn how to make a pretty rose by hand and how to pipe the perfect Mr.Whippy swirl. You will be taught how to emboss sugar paste and create delicate decorations. You will model cute little toadstools and pipe butter cream grass. You will learn how to pipe the very effective and popular rose swirl. The Classy Cupcakes class is a colourful and fun cupcake decorating class perfect for both beginner and intermediate level. Whether you are new to cake decorating or have experience and wish to enhance your skills, you can be sure we are on hand to offer expert advice and guidance. All ingredients and equipment to create the class designs is supplied for use for the duration of the class, including an apron for you to wear. Once you have booked your class space, all you need to do is turn up!